The Mordheim Twitter account has Tweeted with news of an imminent early access stint, which is interesting news to those of us that have been saying for ages that Games Workshop's overlooked tabletop game deserves a digital incarnation in the XCOM turn-based strategy mould. You can sign up to their email newsletter if you want to know the very moment it pops up on Steam. 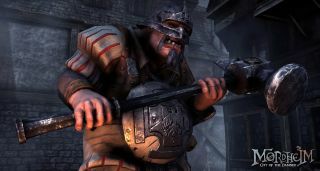 Mordheim is a game about skirmishing warbands in a city destroyed by a magical asteroid. Disparate hopefuls from every corner of the Warhammer universe visit to loot the city or battle its demon infestation. The best thing about it is your squad. Good performances can see your footsoldiers promoted, but if you take a battering your men can lose limbs, gain scars that inspire fear in enemies, or just lose their minds entirely. We'll hopefully see a few similar mechanics in Rogue Factor's take, which is certainly starting to look the part if their screenshots are anything to go by.